Yesterday, HTC quietly announced its first 64-bit device, the Desire 510, notable for bringing LTE to the company’s lowest price point. Today, we heard from HTC that several carriers will be carrying the Desire 510 in the coming months, including Fido, Rogers, SaskTel, TELUS, Videotron and Virgin. The 4.7-inch device sports a FWVGA display at 854×480 pixels — lower in pixel density than we’re used to, but still of good quality — and a 1.2Ghz quad-core Snapdragon 410 chip. This is the first device we’ve seen with Qualcomm’s low-end 64-bit SoC, which sports four Cortex-A53 cores running at 1.2Ghz alongside a slightly updated Adreno 306 GPU. Also onboard is 1GB of RAM, a 5MP rear camera without flash, a VGA front-facing camera, 8GB of internal storage plus a microSD slot, and LTE connectivity for the Canadian market (though exact band support is to be determined). On the software side we have Android 4.4 with Sense 6, which has proven to be one of our favourite OEM skins to date. HTC will also create a special Dot View case for the Desire 510, which has proven popular with the high-end One M8. We don’t yet know exact release dates or pricing, but stay tuned for more in the coming weeks. 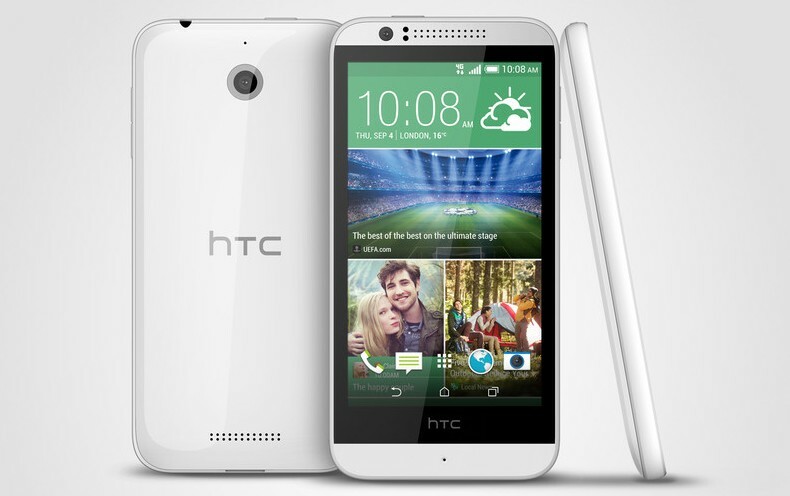 The Desire 510 will be offered in Terra White and Meridian Grey.